Buying a house is exciting, expensive and exhausting. This will likely be the most money you'll ever spend in a single transaction. Whether you’re ready to buy a home now or planning to buy one in the next couple of years, here are a few things you should know. Begin by determining how much you can afford. Analyze your current expenses and budget. Once you start the home buying process, do not open any new lines of credit without consulting your mortgage lender. 2. Start thinking about (and saving for) a down payment. A down payment is a percentage of your home's purchase price that you pay up front when you close your home loan. Not only will it affect how much you'll need to borrow, it can also influence whether your lender will require you to pay for private mortgage insurance (PMI). This typically happens if you put down less than 20% of the home's purchase price. Also, because your down payment represents your investment in the home, your lender will often offer you a lower rate if you can make a higher down payment. How much of a down payment you need depends on the purchase price of your home and your loan program. Different loan programs require different percentages, usually ranging from 3% to 20%. Most people finance the majority of their home with a mortgage. Knowing how much you should save for a down payment can be challenging, but there can be several benefits to waiting until you have 20% or more including reduced mortgage payments, lower interest rate, and no mortgage insurance fees (PMI). Pre-approval for a home loan lets you know how much you can borrow based on your income and existing debt. It also lets sellers know you are a serious buyer and you can comfortably make an offer knowing you won't have to rush to secure financing. 4. Shop for your home. Almost 80% of all home searches today begin on the internet, but you should also find a good real estate agent to represent you in the search and negotiation process. Make sure you have locked down your financing before you submit an offer! Then, look at comparable property when you make your bid. What did other homes in the neighborhood start off as ("asking price"), and what did they sell at? Remember to add how much you can expect to pay in closing costs. Make sure final acceptance is predicated on suitable home and radon inspections. The loan commitment shows that the lender agrees to provide a loan to you, provided certain conditions are met. Verify that all items you have contracted to buy are there, and items you have not contracted to buy have been removed and that the house has not been damaged in the process. Be prepared to sign a lot of paperwork. Once everything has closed, the home is yours! Now you can start getting ready to move into your very own home. 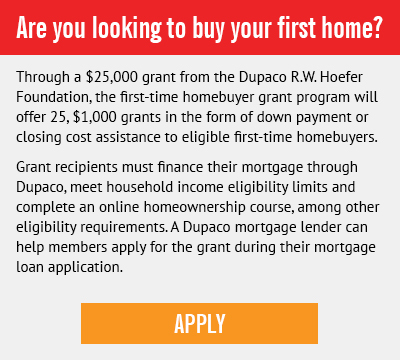 Ready to apply for your mortgage loan? Completing our online application takes about 20 minutes, or, you can save and return to the application later.